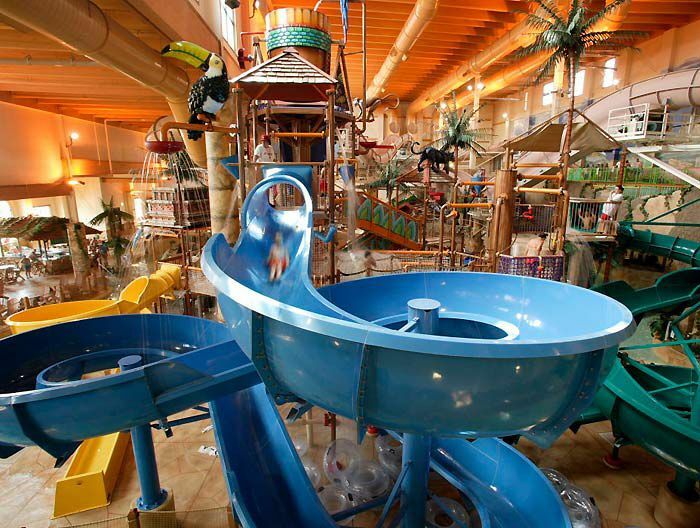 Looking for Wisconsin Indoor Water Parks? There are more indoor water park resorts in the state of Wisconsin than anywhere else in the country. In fact, the whole concept of an indoor water park started in Wisconsin Dells. Below is an alphabetical listing of the state's indoor water parks. If you are looking for more resources, you can read a brief history about how the world's first weatherproof water park came about almost as an accident as well as more info about Wisconsin Dells water parks. Also, I've got a rundown of the best water parks in Wisconsin Dells along with a deconstruction of the sometimes shaky claims that many facilities, including those in the Dells, make in my article, A Lotta Water: Who Has the Biggest Water Parks? What began in the Dells has spread throughout the nation and into Canada. Check out my listings of indoor water parks throughout North America. Indoor and outdoor water parks for resort guests. Indoor park for resort guests. Indoor and outdoor parks for resort guests. Indoor and outdoor waterpark open to hotel guests. Also open to non-resort guests on the summer. Indoor water park for resort guests. Indoor and outdoor water parks open to resort guests. Very small indoor water park open to resort guests. About Theme Parks feature story of the enormous indoor/outdoor water park and resort. Includes review, vacation tips, overview, photo galleries and a ride review. Indoor water park for resort and non-resort guests. Also offers outdoor water park and indoor and outdoor theme parks. Indoor water park for hotel guests and general public. Enormous indoor and outdoor water parks for resort guests. About Theme Parks feature article, profile overview, photo gallery, vacation tips, and ride review.